Rose bushes can freeze to death in areas where winters are particularly cold, such as the northern half of the United States. 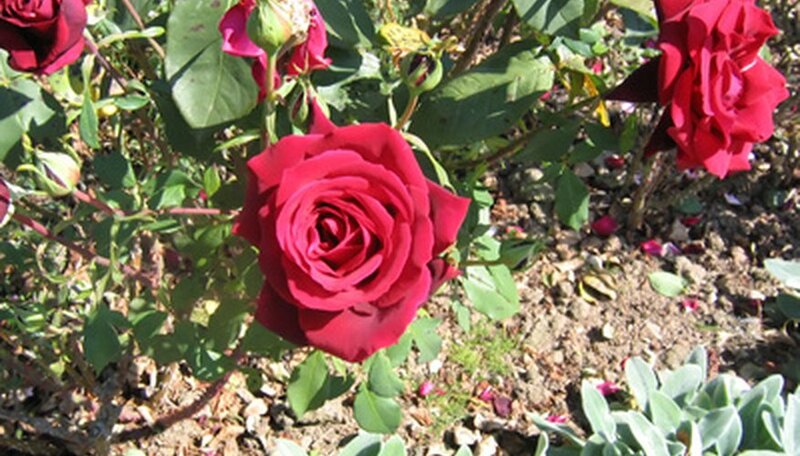 In order to keep roses from having winter damage, only plant roses that are adapted to your area. When ordering or buying roses, be sure that the roses are appropriate for your United States Department of Agriculture (USDA) Horticultural Zone. Also, be aware of the average first frost date in your area by looking at an average frost/freeze map. Begin winter preparation of rose bushes at least 6 weeks before freezing temperatures arrive. Fertilize the rose bush with a fertilizer that does not contain nitrogen, such as one with the nutrient ratio of 0-5-5 on the container label. Apply the correct amount as required on the fertilizer container label. Avoiding nitrogen fertilizers stops leaf growth before freezing temperatures arrive. Fertilize six weeks before freezing temperatures are scheduled to begin in your area. Allow the rose bush plant to harden off by letting the bush be exposed to two or three hard frosts, which are frosts where the temperatures remain below freezing, for at least four hours. Prune longer canes by cutting them in half. Prune a third off the shorter canes. This is a good time to remove any dead or diseased canes. You should end up with five of the largest and healthiest canes pruned into a basket shape. The five canes left should be no more than 36 inches long. Remove all the leaves and don't allow any leaves or cuttings to stay around the base of the plant after cutting because rose diseases can survive the winter under the plant and attack in the spring when the weather warms. Pile 12 to 14 inches of soil around and over the base of the plant. Take the soil from another section of the garden where you are not growing roses in case the soil around the roses in infected with rose diseases. It is very important to cover the area where the rose bush is grafted to the root base. You can see the root graft; it is the thick offset area just above the root base. Cover the hill with another 2 or 3 inches of organic matter such as leaves or mulch to keep temperatures even over the winter. Begin removing the mound one third at a time over several weeks, as the ground begins to warm, so the root graft is not suddenly exposed to freezing temperatures.